The old pope had died, but no successor elected. After waiting two years, the Polos decided to return to the Khan’s court. When the great day for the trip finally came, in 1271, the three Polos went first by sea to Acre. Here they learnt that a new pope, Gregory, had at last been elected. They returned to Italy and delivered the Khan’s letters. Pope Gregory gave them letters for the Khan and ordered two monks to go with the Polos to teach the Tartars about Christianity. Now the Polos again set out and eventually reached Armenia. News came that ahead of them the Sultan of Babylonia had invaded Armenia and was burning and ravaging the country. At this the Pope’s two monks became thoroughly frightened – and decided to return at once to Acre, despite the pleadings of the three Polos. For the next three years Nicolo, Maffeo and Marco Polo journeyed on. At last they came to the court of the Great Khan at Yenking, near where Pekin stands today. The two elder Polos introduced Marco, and the Great Khan was delighted with the fine young Venetian. Very soon Marco became a great favourite at the royal court – he was given honours and titles, and his advice was eagerly sought. So pleased with him was the Great Khan, in fact, that he made Marco governor of Yangchow, an important city of Cathay. Presently, however, the Polos longed to see their native Venice again. So they asked the Great Khan for his golden tablet, without which they knew it would be impossible to make a safe journey through the lands of the warlike Tartars. But the Great Khan refused to give them this necessary passport, for he had grown too fond of the Polos and, much to the annoyance of the other people of his court, relied too greatly on their advice. When Marco pleaded with the Khan to be allowed to return to Italy the Kan did give him permission to travel – but only to India and the Pacific Islands on special missions which always made it essential for Marco to return to Cathay. Then, in the year 1292, the Shah of Persia asked the Great Khan to send him a wife. For this honour, a Mongol princess was selected from the Khan’s court. The journey to Persia was long and hazardous, and none of the Khan’s subjects was willing to undertake it with the Princess. None, that is, except the travelling Polo family. For Persia, they realized, was outside the domain of the Great Khan, and once there they would be free to return again to Italy. 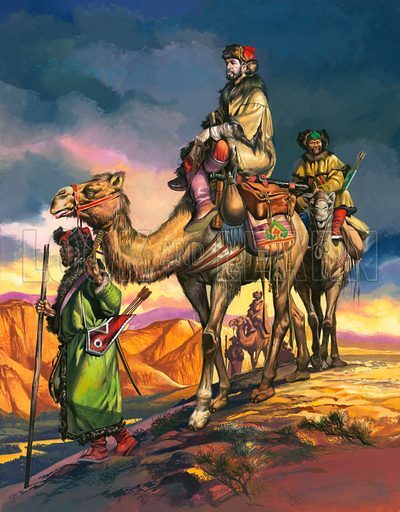 At last, the Great Khan reluctantly gave his gold tablet to Marco and his family – the only people in all the East experienced enough to make the journey to Persia. Before they went, however, the Polos promised the Great Khan that someday they would return. With fourteen ships and nearly two thousand sailors, the three Polos set out with the Princess for Persia. For nearly two years, delayed by wind and weather, they sailed the oceans. Hundreds of their sailors died on the journey. But because of the navigation skills of the three Polos, the ships at last reached Persia, and the Shah was given his bride. Here, however, there was bad news for the travellers. The Great Khan, they learned, had died while they were at sea. Now released from their promise to return to Cathay, and their mission to Persia accomplished, the Polos set out for their home in Venice. When they arrived there they had been twenty-four years away from the city. The treasures they had brought with them from the East now made them richer than ever. Then war broke out between the city of Venice and the city of Genoa and, in common with all other rich families of their city, the Polos were called upon to provide a ship to fight in the war. Marco at once bought a galley and in the autumn of 1296 he himself sailed in command of it against the Genoese fleet. But after a great sea battle his ship was set on fire and boarded by the Genoese, and Marco was captured. Now he was taken to Genoa and thrown into jail. There one of his fellow prisoners was an Italian called Rusticiano, who, it so happened, could write, an unusual accomplishment in those days. To while away the weary hours, Marco told Rusticiano all about his long travels to the East, and Rusticiano wrote down the details. The hours passed into weeks and the weeks into years. For three years Marco languished in jail, dictating as Rusticiano wrote. Then the great traveller was allowed to pay a ransom for his release, and as the thirteenth century closed he returned to Venice. Rusticiano bound his writings in a book and called it The Travels of Marco Polo, and from it, men in Europe learned a great deal about life in China and the East. Following in Marco’s footsteps, and using his book as a guide, they journeyed into China, and trade between the two continents began.